After my review of the 2011 Muppets movie, I was accused of being a Muppets hater. It wasn't true; I just thought the movie was only so-so and could have been better. And now, about two and a half years later, I get to prove that I was right, because this newest installment of the Muppets is complete and utter fun - and what I would have liked 2011's to be. The film starts at the end of the last movie, when the Muppets have wrapped up filming. The gang wonders what they should do now, and finally decide on doing a world tour. Producer Dominic Badguy (Ricky Gervais) - pronounced "Bad-gee," he says, because it's French - signs up to help produce their tour, and everyone seems to like him except for Kermit (voiced by Steve Whitmire). Kermit's intuition soon proves to be correct, as he's mistaken for the infamous Constantine (voiced by Matt Vogel) in an evil plot hatched by Constantine and Dominic, and is thrown in a Russian gulag (jail). Constantine, who is Kermit's doppelganger, manages to convince all the Muppets that he's Kermit, and he and Dominic are free to go about their real plan: stealing the crown jewels of England. There were so many cameos in this film, ranging from seconds on screen (Lady Gaga, Tom Hiddleston) to juicier roles (Ray Liotta, as a fellow gulag prisoner). 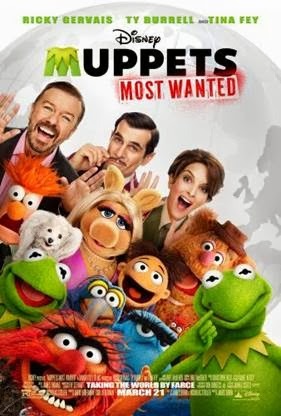 Tina Fey stars as Nadya, a female warden at the prison who has a secret crush on Kermit, and Ty Burrell as Jean Pierre Napoleon, who has to work with another cop Muppet to figure out who has been stealing artifacts across Europe (and they finally connect it to the Muppets' tour). More cameos are provided by Chloe Moretz, Christoph Waltz (doing the waltz - ha! ), Salma Hayek, Danny Trejo, Stanley Tucci ... and the list goes on. Yes, see this movie. I was pleasantly surprised at this film, as I wasn't expecting much compared to the 2011 movie. There's a ton of song and dance numbers that are hilarious, and a few small things as well; Constantine calls Miss Piggy "Miss Pig" throughout, and when he lets her have free reign she does the Macarena at one of their shows. Tina Fey and Ricky Gervais do a great job in their roles, and I'm so curious as to how they filmed with or without the Muppets - in one scene, Constantine runs his fingers (do amphibians have fingers?) through Gervais's hair, and it looks so real on-screen. The movie definitely leaves itself open for another Muppets feature, as well, and I wouldn't be surprised if we see them come back to theaters again in a few years. Muppets Most Wanted is in theaters today, March 21st, and is rated PG with a runtime of 112 minutes. 3.5 stars out of 5. Sounds like fun. I love the muppets. I didn't see the last movie. I don't get to see many movies at all. I'm going to into a corner and cry now. LOL, Patty! Well the first one is definitely out on DVD by now, so you could check it out. It was cute but I thought it could have been better, and this one was a lot better. Somehow, the Muppets never can do wrong in my eyes. It's a tie to my childhood, I'm sure, but I'll be taking my boys to see this one soon! I think that is how most feel about the Muppets :). I can't wait to see this movie! Not only because I love the Muppets but because I also love Ricky Gervais!! I had the chance to go to the last Muppets Movie premiere, it was so much fun. I am really looking forward to this new film, I hear Tina is hilarious in it!